Readers will recall that my daughter’s post on shadowing students resulted in over 3 million hits (and numerous requests for reprinting or interviews with reporters from all over the world). My follow-up received half a million. I called for educators to share other stories or versions of student shadowing. That led to a few Canadian educators sharing a policy in Ontario that is focused on individual student experiences and making “attempts at learning” the focus of action research locally. It is a Ministry-wide initiative entitled the Student Work Study Teacher Initiative (SWSTI) in which funds and other incentives are provided for Student Work Study Teachers (SWST) to conduct such collaborative investigation and discussion with volunteers. I particularly like that the work focuses on “students of mystery“! In Ontario Canada, the SWSCI is a Ministry of Education, research based, student-centered, collaborative inquiry project intended to study the thinking and learning of students from K-8. During the initial stages of this project, a focus was placed on studying students performing at Level Two (C) in either literacy or numeracy. More recently, the Student Work Study and classroom teachers study any “student of mystery”– specifically students at any level not progressing as expected. Through Ministry funding to support this broader initiative, Student Work Study Teachers (SWST) have been hired in every school [district] across Ontario. Collaboration is a cornerstone of this project; therefore, funding for substitute teachers is also provided. The number of SWSTs hired per district is dependent on total number of students. Some districts have one SWST while others have nine. 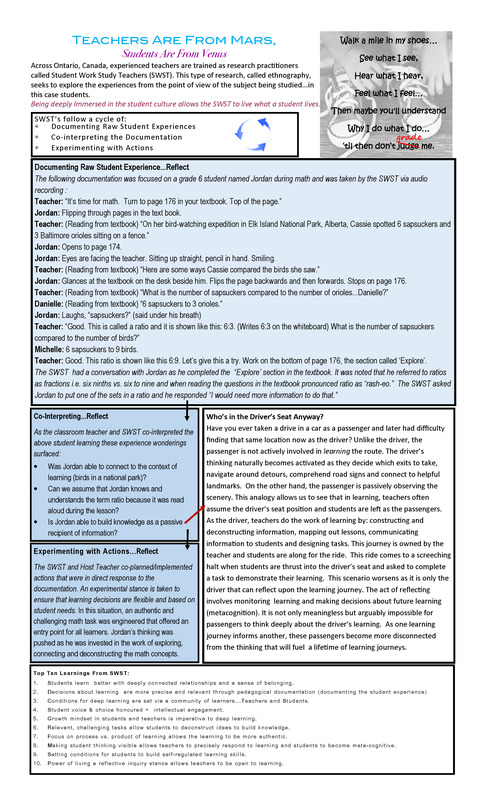 With a focus on target students, each Student Work Study teacher engages in a detailed documentation of observations, conversations and student work products – rich description of that student’s learning. The SWST shares and co-interprets the documentation with the classroom teachers on the fly, as well as during pre-arranged release sessions. Classroom teachers volunteer to be a Student Work Study host teacher and the interest for this is very high. The SWS teacher observes the target students (usually 2 per class) as agreed upon by the SWST and classroom teacher. The SWST usually observes/documents learning for 50-100 minutes per day for approximately three two-week blocks. The SWST will do this in several classrooms each school year. At the end of the school year the SWS teachers are required to submit their research and findings to the ministry. This involves allowing the documentation to highlight a supposition, providing evidence and pairing it with the expert research in the field. The full Student Work Study Collaborative Inquiry requires a significant mind-shift. The focus changes to looking closely at a student’s attempt to learn as opposed to an analysis of teacher instruction or activity. All conversations and possible plans of action stem only from what the students are thinking and doing (and why), not from teacher instruction. It doesn’t matter what has been taught if it hasn’t been learned! The collegial work thus depends upon an “open to learning stance.” This requires approaching teaching and learning with wonder versus sticking to comfortable assumptions and techniques. When host teachers have understood this shift, such analysis becomes a valued and permanent part of their practice. In short, the key to improving student success lies, ironically, in reserving judgment on what you are seeing; and acting on the premise that the more we hear and see students try to learn, the more we can improve learning. Agree with Howard58; this teacher has a long way to go. Merely stating the definition of a ratio to a group of students (even with 1 or 2 examples given) is not enough. It needs to become an exchange between teacher and students in order for students to be “driving the car!” Interestingly, the Direct Instruction methods of Engelmann and his colleagues does add this interaction. Although many criticize it because the order of introduction of definitions and other concepts is quite scripted, it does include constant checking (through group responses and individual checking) to see if the concepts have been accurately grasped by the students. Thinking about this approach more, I think its true benefit comes from the fact that it is a refreshing departure from our obsession with positivist, reductionist scientific data to gauge student learning and to inspire professional learning. That approach is often communicated in a language that is so divorced from the human side of teaching and learning that it is rendered all but useless to inspire change in behavior. This approach is phenomenological– it is sensitive to how learning is actually experienced by conscious human beings. THAT will be what motivates a teacher and to improve practice– when he/she senses the direct, raw impact his/her instruction is having on students. It involves human connection, communication and actionable steps. It is qualitative data gathered in a rigorous way, guided by a system for improvement. This sounds like a great paradigm for professional learning and, of course, the benefits to the student are profound. I really do hope this paradigm is embraced sooner rather than later. Thanks for this. This is really innovative. I wonder if the whole project, thought, is unavoidably skewed towards observable behavior. In a philosophy class, for instance, much of student ‘work’ takes the form of fighting through confusion resulting from addressing ambiguous questions. We can’t observe the mental state of confusion of a student, yet this is indicative of deep authentic learning. Also, with some subject matter like philosophy and history, learning ah ha moments come at unpredictable times and therefore a 3week observation period would prove inadequate. Having said this, I think this would be an unbelievably valuable exercise. I am not quite sure of the target of this research. Is it to study the behaviour of the learner or to assess the effect of the presence and actions of the SWS on the teaching behaviour of the classroom teacher. Your example classroom teacher has a long way to go ! Love Shannon’s drivers vs. passengers analogy – I’m going to borrow that when writing about the need for PBL (& other active learning methods)!